Gives you that vintage tube amplifier "bluesy" flavor; if you're after that killer blues sound, then you know it's loaded with warm overdrive - for a killer creamy yet crunchy tonal blend. 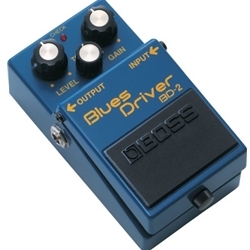 And the BOSS BD-2 Blues Driver is designed to deliver just that sound. It's like having a finely-aged vintage tube amplifier in your rig, only it's built tough - just like all BOSS pedals - and it's offered at just a fraction of the price. If you're playing Blues - or if you're wanting to give your rock rig a different overdriven flavor than every other guitar player on the block - then you'll definitely want to put the BD-2 Blues Driver into your signal chain.